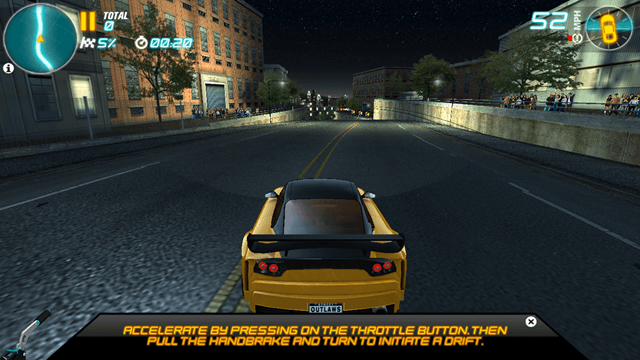 Drift Mania: Street Outlawz Lite is a free car racing game for Windows 8 and Windows 8.1 devices. The game is central about the drift style of racing. When you launch the game for the first time on your Windows 8 or your Windows 8.1 device, you will be taken to a tutorial screen where you can learn about the controls of the game. You will first be shown the list of controls in a text format, and then you will also be taken to a practical tutorial where you can actually test out the controls for yourself. Once you have successfully completed the tutorial of the game, you will be taken to the main menu of the game from where you can choose to begin your career, or battle it out against other players. Drift Mania: Street Outlawz Lite is a really cool drift car racing game that allows you to drift your vehicle and have a lot of fun while doing so. It is available for free from the Windows App Store. When you launch the game on your device, you will be shown the below screen. As you can see, this is the tutorial screen of the game. 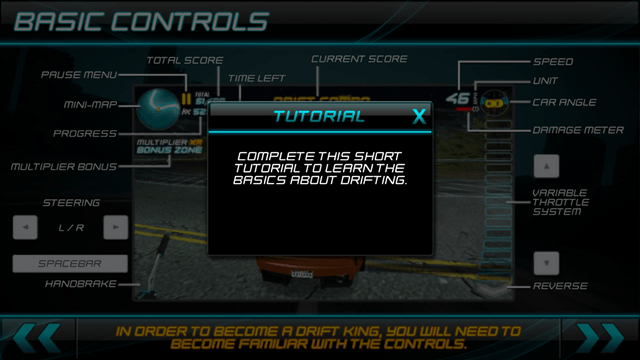 When you click on the cross button on the box titled Tutorial, you will be shown the list of controls in detail, and then upon clicking on the arrow button in the bottom right corner of the screen, you can proceed to the next screen, which is basically the practical round, and here you get to test out the drift controls for yourself. The controls are – Left/Right arrow buttons to steer the car, down arrow for brake/reverse, up arrow for throttle, and spacebar for handbrake. You can use the combination of the above controls to drift and win the race. The above is the tutorial screen. In the above screen, you will be shown a list of tips at the bottom of the screen that will help you progress in this car racing game. Just do as the help tips at the bottom say, and you will be able to finish of the tutorial in no time. It should also be noted that it is a pre-requirement of the game that the tutorial should be finished before you can start the main game itself. The speedometer is displayed at the top right corner of the screen, and the remaining racing track is shown in the left corner via a map, as well as in the form of percentage of track completed. You can also see a timer ticking by, and you have to complete the track in this given time. Soon enough after completing the tutorial of the game, you will be taken to the main menu of the game, where you can choose to practice, enter career mode, battle mode, or upgrade your ride. Let’s head into the career mode now. These cars are absolutely essential in winning the racing game itself. There are different cars which are suitable for different tracks, and you should make sure to make the right choice while selecting a car for a particular track. 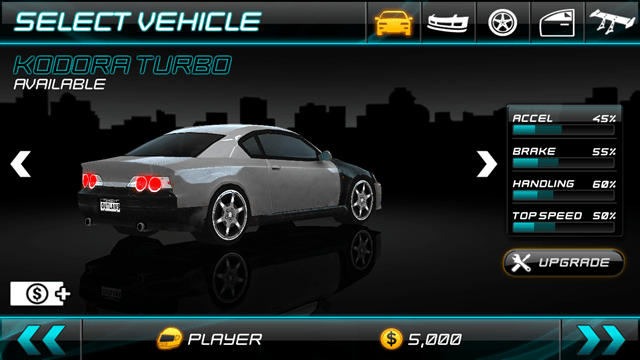 You can see the remaining player credits at the bottom of the screen, and you can choose to upgrade the various component of the selected car by clicking on the appropriate option at the top right corner of the screen, like wheels, windows, etc. You can choose the next or previous cars by clicking on the right/left arrows at the center of the screen, and you can choose to proceed with your selection by clicking on the arrow button at the bottom right corner of the screen. Once the career mode begins, your aim is to accumulate maximum drift points and player credits. 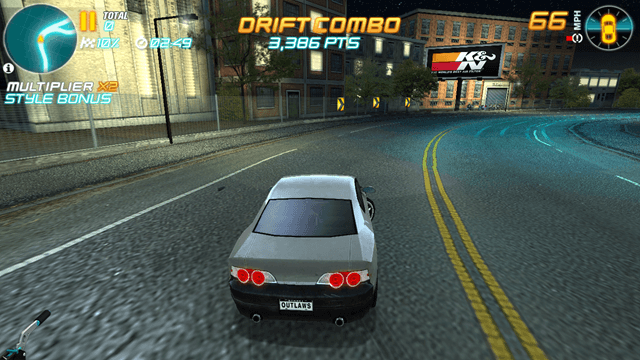 You get limited time to complete the race, and your aim should be to finish the drift racing game track in as little time as possible with the minimum damage to your car. This will give you maximum amount of player credits as your reward when you complete a race. Battle mode is similar to career mode, except in this mode, there are other cars along with your cars whom you have to beat in terms of maximum drift points accumulated and first across the finish line. Practice mode is a mode where you can try your hand on various tracks without losing any player credits, but at the same time, you also don’t win any credits for racing in the Practice drift car racing mode. All these modes can be selected from the main menu when you launch the game. Also try Asphalt 8: Airborne and Offroad Racing. I really like Drift Mania: Street Outlawz Lite because of its graphics as well as the low battery drain encountered while running this game on less battery. The only thing which I didn’t like is its large size; it is about 300Mb in size! Apart from that, it’s a fully featured game and there is nothing in particular to hate about this game! 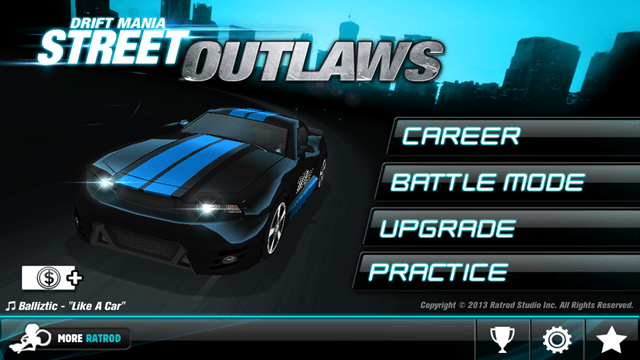 Get Drift Mania: Street Outlawz Lite.